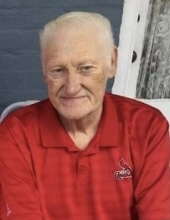 Gene Oveston Sisk, 73, of Keokuk, IA, died Saturday, April 6, 2019 at UnityPoint Health in Keokuk. He was born on December 21, 1945 in Marianna, Arkansas, the son of Lowell and Estella Sisk. He graduated from Central Lee High School in rural Donnellson with the Class of 1963. On July 11, 1965, Gene was united in marriage to Linda Williams in Keokuk. She preceded him in death on January 3, 2012. Gene had been employed at Henkle-General Mills-ADM in Keokuk for thirty-seven years. He was a former member of the Keokuk Jaycees and the Elks Club. Gene enjoyed going on camping trips with his family. He was an avid St. Louis Cardinal, Chicago Bear and Hawkeye Fan. He loved to watch NASCAR races and the Golf Channel. He is survived by two daughters, Lori Miller and her husband Frank of Bloomfield, IA, Gina Sisk and her wife T.J. of Keokuk, one son, Jeffrey Sisk and his wife Heather of Keokuk, six grandchildren, Jennifer Olinger (Nathan), Dustin Miller, Dakota Miller, Jordan Sisk, Kylie Sisk and Nathan Crile and an honorary granddaughter, Jennifer Spicer, five great-grandchildren, Chelsea, Kaitlyn, Ashlyn, Brayden and Jacob Olinger, two brothers, Charles Sisk and his wife Sandra of Keokuk and Larry Sisk and his wife Hilda of the Quad Cities, two sisters, Betty Carle and her husband Mike of Fort Madison, Alphia Lang and her husband Greg of Donnellson, and nieces and nephews. He was also preceded in death by one sister, Alice Picton and one brother-in-law, Terry Picton. Funeral services were held at 10 a.m. Thursday, April 11, at the Vigen Memorial Home in Keokuk, IA with Pastor Mike Shea officiating. Burial was in the Sunset Memorial Gardens in Keokuk, IA. Visitation was held after 1 p.m. Wednesday, April 10, at the Vigen Memorial Home with the family meeting with friends from 6 – 8 pm. Memorials may be made to Mancountry. "Email Address" would like to share the life celebration of Gene O. Sisk. Click on the "link" to go to share a favorite memory or leave a condolence message for the family.